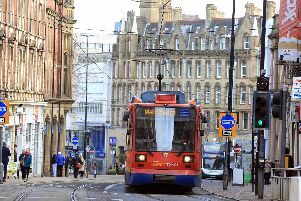 The weather in Sheffield is set to be dull today, as forecasters predict mild temperatures and cloud throughout the day. However, Friday will see the weather worsen as heavy rain and strong winds are set to hit, with warnings currently in place for Yorkshire. This morning will be considerably warmer than yesterday, with the temperature reaching its peak of 12C by lunchtime. It will remain cloudy but dry throughout the morning. This afternoon will continue to be dull, with the temperature remaining at 12C. This evening will become quickly dark, with the temperature dipping as the evening progresses. Tomorrow will then see heavy rain throughout the early morning, which will then turn into lighter rain and continue throughout the rest of the day. A yellow weather warning for wind is currently in place for Yorkshire. Although this does not yet cover Sheffield, the city is still expected to see strong winds on Friday. According to the Met Office: “A weather system will move eastwards across the north of the UK on Friday bringing widespread gales. “Inland gusts of 60-70 mph are possible across north Wales, northern England, northern Ireland and all of Scotland, with gusts of 80 mph in exposed locations in northern Scotland. Looking ahead for the UK in general, “Next week starts generally settled, especially so in the west, whilst scattered showers are likely in the east where they could be wintry at times,” said the Met Office. “From mid week onwards the weather pattern becomes slow moving, with easterly winds developing and bringing showers to many parts, these possibly wintry away from coastal areas. “Overnight frosts and patchy freezing fog are also likely at times. Any wet and windy weather is likely to be confined to the west and northwest, although rain may affect the south at times, bringing with it a risk of hill snow.